With the growing use of sms in our everyday life, sms is definitely the effective way to reach your customers. SMS is the top 5 media used in advertising, thus more and more companies are adopting this method in their marketing strategy. It is also an effective and cheapest communication way to send out information to a large recipient group simultaneously and instantaneously. SMS newsletter is a solution where you can reach out to your customers and providing information to them via SMS. You can send bulk SMS alerts to your targeted customers at one go, reaching to all your customers effectively and efficiently through mobile phones. Website newsletter SMS is an option where users are able to compose and send SMS alerts out via the Internet to mobile phones. If your company needs to send out regular messages or SMS alerts to large audiences and prefer an instant and hassle free alternative to sending SMS manually from mobile phones, then Website newsletter SMS would be a better choice for the company. 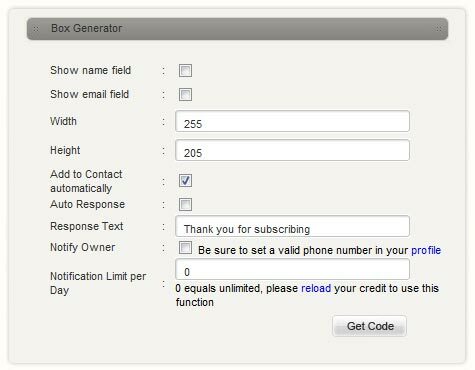 The iSMS subscription box generator is a useful tool for both SMS newsletter and Website newsletter SMS, regardless of which choice you preferred. 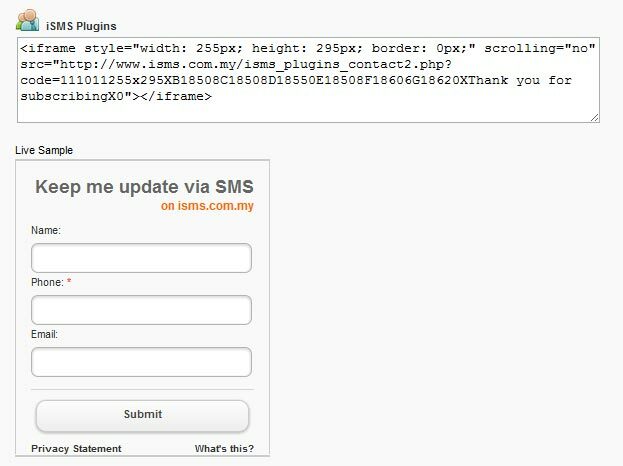 This SMS subscription box is a plug-in that can be incorporated into your websites or blogs, easily and conveniently. With this subscription box generator, building your customer database has never been easier. Register as a member of our iSMS Online Service, and get a free 5 credit demo pin from front-page to try out our service. FREE Registration HERE. You can always choose the packages that we offered to purchase your isms credit. You may view our offers here. Select fields you want to display. Response text will be send to subscribers. Owner will be notify if checked. Code as above will be generated. Paste the code at your web site for the form to appear.